To celebrate Vinyl Record Day, Founder Gary Freiberg, in collaboration with the CVR blog, has donated a great collectible to give away to a lucky blog reader, a limited edition, framed for wall display, Picture Disc of phonograph inventor Thomas Edison! This disc has Edison speaking the first words he recorded in 1877 ("Mary Had A Little Lamb" but you probably already know that) with assorted early recordings including P.T. Barnum (1890), Sophie Tucker (1908), and Theodore Roosevelt (1919). To enter, simply send an email to rbenson30@wi.rr.com with the words "Vinyl Record Day Edison Picture Disc Contest" in the subject line and you are automatically entered. A random drawing will be held at 5pm CST on August 12th, which is of course Vinyl Record Day! Limit one email entry per person. 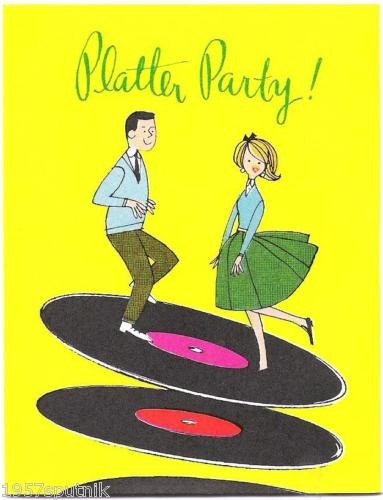 Additionally, Vinyl Record Day is to be celebrated Saturday, August 17th, so make plans to have some friends and family over and have a platter party! When Thomas Edison invented the phonograph on August 12, 1877, little did he know just how much influence his “Talking Machine” would have, not only in the music industry, but in pop culture as well. Records are a part of the music of the ages and it is up to us as individuals and retailers, not only to enjoy our favorite recordings, but to preserve them as well; thus Vinyl Record Day was born. Vinyl Record Day (www.VinylRecordDay.org) is celebrated on August 12th (or the first Saturday following the 12th) and was conceived and brought to the forefront by vinyl enthusiast and vinyl record historian Gary Freiberg. I spoke with Gary about the meaning of Vinyl Record Day and how we can help as individuals and what retailers can do to help preserve this timeless medium and international treasure. “Vinyl Record Day is about celebrating vinyl records and the public should take notice of this special day. Invite friends and family over for a barbeque, maybe form a block party and play records, think records and talk about records and what they mean to each of us individually and culturally,” explained Gary. A very dynamic and immensely important point Gary talked about is that only 5% of our musical history has been transferred to CD, so it is our responsibility to preserve this medium. Maybe your grandfather, sibling or cousin released a record and, although it may have not made the “top ten,” it is our music and some of these wonderful recordings cannot be found anywhere else. For instance, I own a vinyl copy of a Spiro Agnew speech and one of our most revered presidents John F. Kennedy has released several recordings, as have other influential and historical figures. Additionally, Vinyl Record Day is a nonprofit organization that aims to educate the public and encourage all of us to preserve these international audio treasures. It is also a marketing opportunity for any vinyl record retailer. “Vinyl Record Day is focused on educating the public, this timeless medium is in our hands, don’t leave the preservation of vinyl to fate. Vinyl records represent historical audio documents and just as we preserve historical literature, we are the custodians of this audio history. Vinyl Record Day is more than one day a year set aside for celebration, it is also for the industry itself,” acknowledged Gary." We also discussed past celebrations, from the inaugural Vinyl Record Day in San Luis County, California and the international support and attention that Vinyl Record Day receives as well. “Vinyl Record Day hopes to continue to educate the public on why and how to care for a record collection because these collections are not only a part of who we are individually, but to assure that future generations will not lose a vital link in recorded history,” related Gary. “We recently got accepted and are under consideration by the USPS for a stamp series that may feature classic album cover art and the history of records. Now we are organizing public support for the stamp series. We encourage, no plead, for the public to do a snail mail letter letting the Citizen's Stamp Advisory Committee know you support the stamp series,” said Gary. As an avid vinyl record collector, I truly enjoyed my conversation with Gary, who is very passionate about the cause. Vinyl Record Day is a nonprofit organization that needs the help of all of us, consumers, collectors, musicians, retailers as well as the record companies. So, as you celebrate Vinyl Record Day this August, think about the history, preservation of the format and enjoyment you receive when listening to your favorite records. For more information and how you can help as an individual, please visit the website, www.VinylRecordDay.org and let Gary know that you endorse all of his efforts. The Vinyl Record Day proposal for a series of first class stamps has been accepted by the U.S. Postal System! Current status is "Under Consideration" which is a notable big step toward issuance according to representatives of the Citizens' Stamp Advisory Committee.